This site is my homage to what is in my opinion, the finest line of mass-market home speakers ever made, the 1985-91 Polk Audio SDA line, from the Monitor series (technically not SDA speakers, but part of the Polk line at the time) all the way to the flagship SDA-SRS. 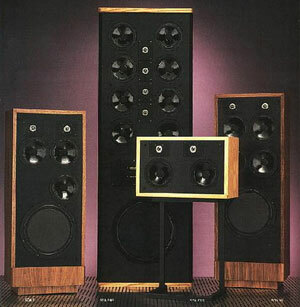 I received my first exposure to the line in 1986, and purchased my first pair, Monitor 10s, shortly thereafter. Over the years, I've had other speakers, but I've always come back to those 1980s Polks. Matthew Polk's innovation resulted in speakers that, to this day, cannot be surpassed without spending many thousands of dollars. There is still a vibrant community of avid Polk Collectors and those vintage '80s Polk speakers are still quite in demand. Here at PolkSDA.Com, you will find listings of all of the Polk Audio speakers from the mid-1980s through the early 1990s, including specifications, pictures, and some example Ebay auction results. There are also some vintage advertisements, as well as a full review of the flagship SDA-SRS from 1985. I now own 9 pairs of vintage Polk Audio speakers. I'm hoping to ultimately own one of every model listed on this site (hey, a guy can dream, can't he?). of Britannia Investment Corporation used under license by Polk Audio Incorporated. This site is neither endorsed by, nor affiliated with Polk Audio, Inc.